One person is confirmed dead after an unattended freight train carrying oil rolls into a Quebec town, creating a daylong inferno. A freight train carrying crude oil derailed and exploded early Saturday in a small Quebec town near the Maine border, killing at least one person, causing widespread destruction and forcing about 2,000 people to flee their homes, authorities said. 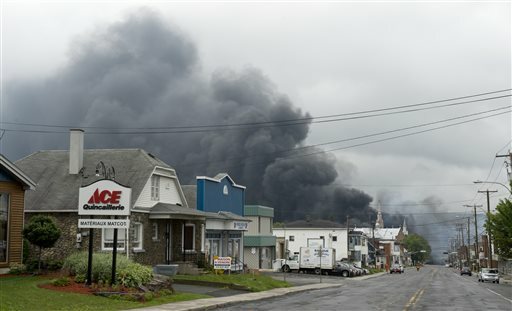 Multiple explosions rocked the town of Lac-Megantic, about 155 miles east of Montreal and 185 miles north of Portland. The train was carrying as much as 2 million gallons of oil, which fueled an inferno firefighters tried unusuccessfully to extinguish all day Saturday and late into the night. 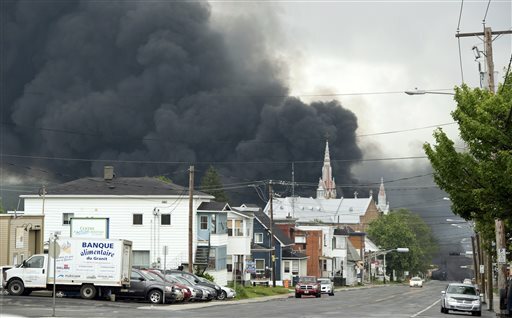 Smoke rises from derailed railway cars that were carrying crude oil in downtown Lac-Megantic, Quebec, on Saturday. Quebec Provincial Police said they had one confirmed death Saturday night, but no information on injuries. They also said several people were reported missing after the unattended train derailed. The railroad that operated the train, the Montreal, Maine & Atlantic Railway, said it had reports of fatalities and injuries but provided no details. When the explosion occurred, the train was about to cross into Maine on its way to the Irving Oil refinery in Saint John, New Brunswick. 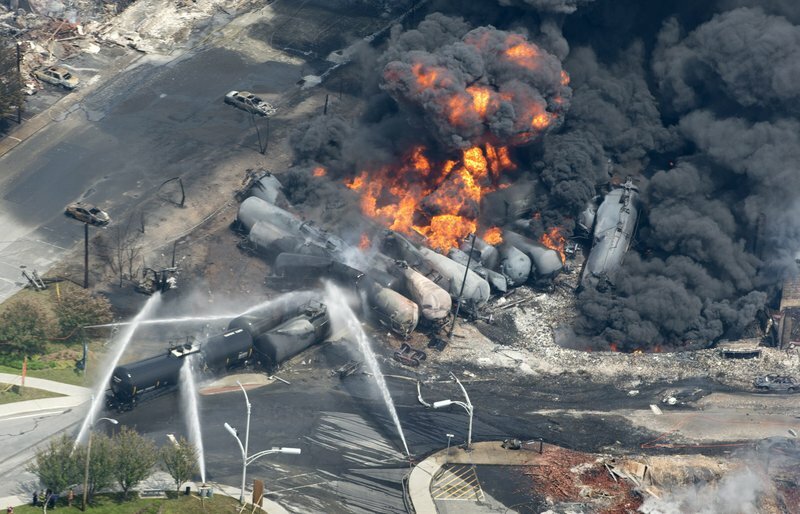 Early Saturday evening, the railway said the derailment occurred after an engineer got off the 72-car train about seven miles outside Lac-Megantic at the end of his shift. The engineer told the company that he set the train’s brakes and then went to his rest stop at a nearby hotel and left the train for a new crew to take over. The engineer said he left the train about 11:25 p.m. Friday, about an hour and 50 minutes before the derailment, the railroad said. At some point after he left, the unattended train rolled downhill into the town, where it derailed and exploded, the railroad said. A railway spokeswoman said the engineer was adamant that he set the brakes and she said the company would investigate whether the brakes had indeed been set or had malfunctioned. 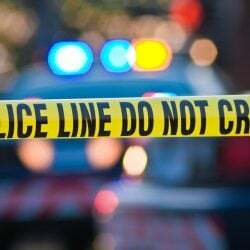 Earlier in the day, Quebec Provincial Police Lt. Michel Brunet said there were many reports of missing people in the town of about 6,000 residents, but authorities weren’t sure if any of them were hurt in the explosion. 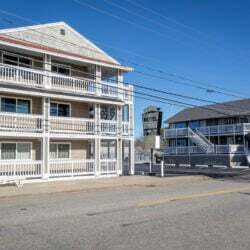 “We’re told some people are missing but they may just be out of town or on vacation,” Brunet told a news conference, according to The Associated Press. Onlookers said large amounts of oil spilled into nearby bodies of water, the AP reported. 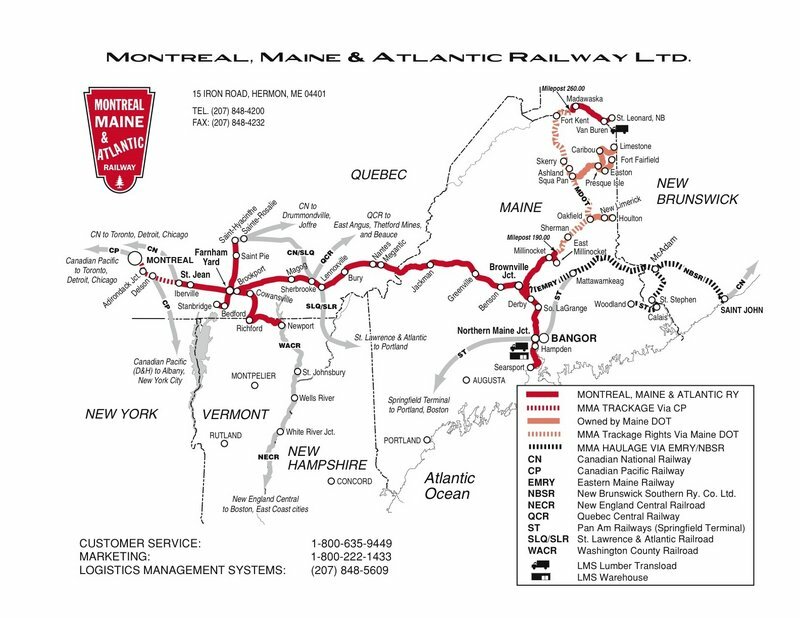 Montreal, Maine & Atlantic Railway Ltd. is based in Hermon, outside Bangor. The company owns more than 500 miles of track serving Maine, Vermont, Quebec and New Brunswick, according to its website. 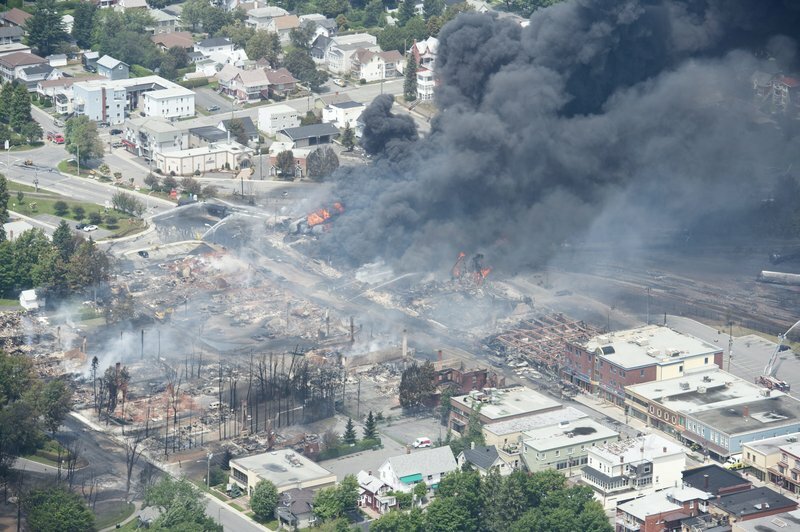 A news release put out by the company said it was “devastated” by the derailment and explosion and would soon have representatives in Lac-Megantic to help residents affected. Quebec Provincial Police Sgt. Gregory Gomez said there are several homes and stores near where the explosions occurred, along with a bar that was open at the time of the crash. “We do fear there are going to be casualties,” he said. 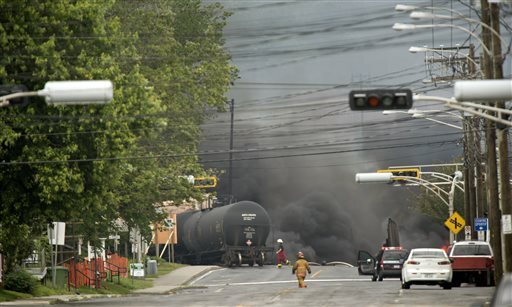 Flames and billowing smoke could be seen for several miles hours after the derailment, the AP reported. Some of the train’s cars exploded and the fire spread to a number of homes. As of 10 p.m. Saturday, firefighters were still trying to extinguish the oil-fueled blaze, police said. Environment Quebec spokesman Christian Blanchette said a large but undetermined amount of fuel also spilled into the Chaudiere River, according to the AP. 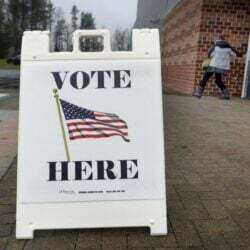 Seven municipalities in Franklin County dispatched eight fire trucks carrying about 30 firefighters to the scene starting around 3 a.m. Saturday, Franklin County Sheriff’s Office dispatcher Stan Wheeler said. 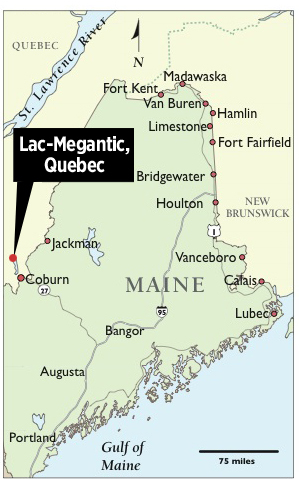 Lac-Megantic is about 20 miles from the Franklin County border. The firefighters are from Chesterville, Eustis, Farmington, New Vineyard, Phillips, Rangeley and Strong, he said. Franklin County Emergency Management Director Tim Hardy also went to the derailment site, Wheeler said. A railcar generally can carry between 25,000 and 30,000 gallons of oil. Given its more than 70 cars, the train that derailed had the capacity to be carrying 1.8 million to 2.2 million gallons of oil. Authorities set up perimeters as firefighters battled to control the fire, the AP said, and worried residents looked on amid fears that some of their friends and loved ones may have died in their homes. Firefighters and rescue workers from several municipalities, including Sherbrooke and Saint-Georges-de-Beauce, were called in to help deal with the disaster, the AP reported. According to the Railway Association of Canada, a railroad-industry group based in Ottawa, Canadian railroads transport about 230,000 barrels of crude oil per day, equivalent to about 9.7 million gallons of oil. One of the six people arrested in a protest June 27 in Fairfield against the transportation of crude oil in Maine said the group was hoping to raise more awareness about crude oil before the train derailment catastrophe in Lac-Megantic occurred early Saturday. Read Brugger, 63, of Freedom said the group was going to plan another protest against Montreal, Maine & Atlantic Railway after its recent protest against Pan Am Railways in Fairfield. 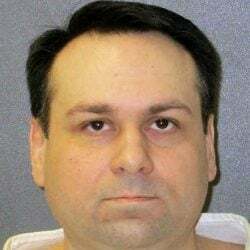 Brugger said he’d been tracking MM&A Railways and said it transported crude oil about two or three times a week via the route it was using Saturday. 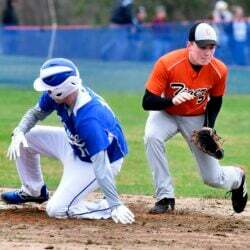 Jesse Scardina of the Morning Sentinel contributed to this report.